I haven’t done a race report in a while, but last weekend’s race brought out so many emotions and thoughts that I wanted to remember them all …. 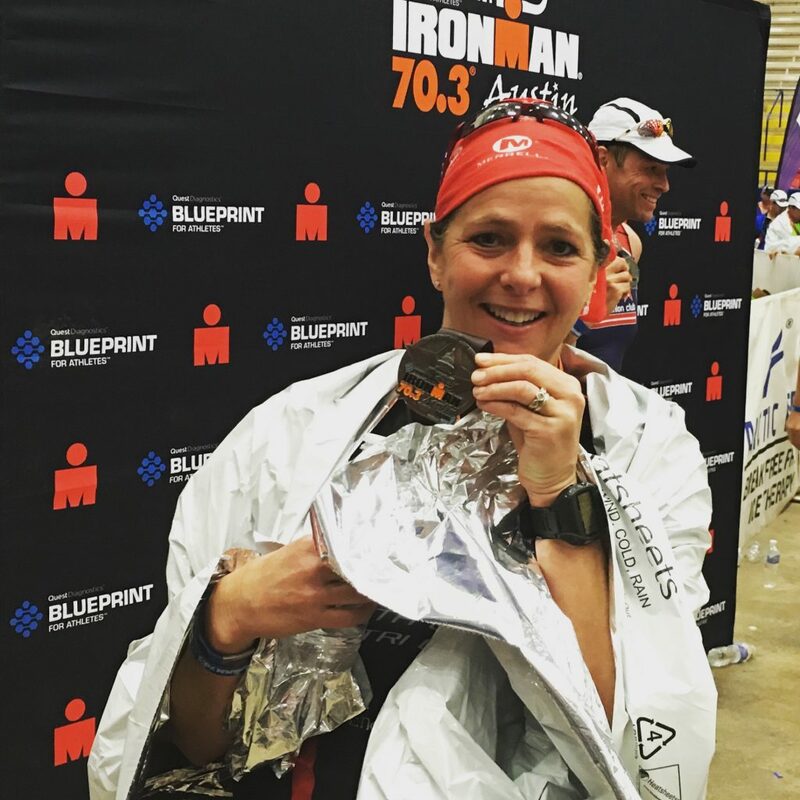 It was Austin 70.3 race, which is a Half Ironman consisting of 70.3 miles of exercise (1.2 mile swim + 56 mile bike + 13.1 mile run = 70.3 miles total, hence the “70.3” races). The day before the race I drove the bike course, just to get an idea of what the potholes & hills were like. I had read that the road conditions were bad, but I wanted to see what I was in for. There were some definite nasty spots, but I thought I could handle it all (ha!). It was raining steady with about 15mph winds, the lake was really choppy and a sign was posted that said “Swim at your own risk”. That was not very comforting…but it was also the day before. We had less than 24 hours for the weather to improve. On race day I arrived at the race site at about 5am & sat in my car for a while since it was cold. After a short bus ride, I made it to T1 (swim start/bike transition) and started preparing for the day. 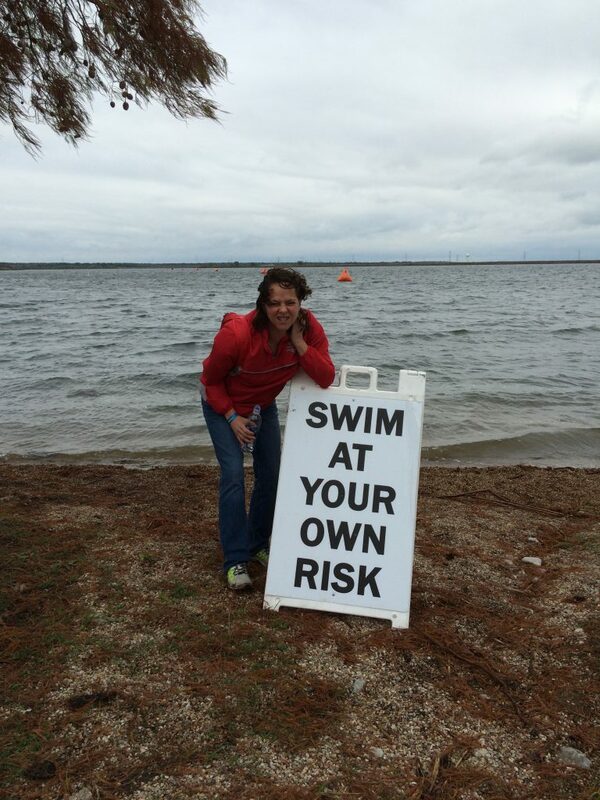 It was sunny, about 50° and very windy, making it the coldest triathlon I had ever done. The porta-potty was the warmest place that morning; I was tempted to stay in there until the start of my race (wasn’t going to happen, but I was warm in there!). I took the advice others and swam in just my bra under my wetsuit, so I would have dry clothes to put on at the beginning of the bike. I also put a plastic dry-cleaning bag over my body and under my wetsuit that was supposed to provide extra insulation. I don’t know if it did, but it certainly didn’t hurt. My wave was the 4th group to start, just after the pros and the under 24 guys and 55+ men. Water temp was 68° and the wind was gusting all around, causing waves in what should have been a calm lake. I positioned myself up front as normal, since I’m a strong swimmer and didn’t want to deal with passing over people. We took off hard, with plenty of kicking and slapping going on. It was really chaotic and I was starting to freak out, my heart rate rising. Soon my goggles were kicked and water started seeping in. I continued to swim but realized I had to fix my goggles, so had to stop & tread water to do so. I was mad, I was in a near panic and this was supposed to be my strongest event. With every breath I took there was a wave crashing into my face, and then every few breaths I was either kicked or was bumping into someone else. It was the most crowded, hardest swim I had been in in a very long time. I saw a raft and contemplated stopping to hang on to regain my composure. But I couldn’t. This was supposed to be my strength and here I was freaking out, so I kept on going. At the first turn things got a little better, as the current was more at our back. But there was never a point to settle in; there were too many people all around and too many waves. I was unintentionally swallowing a lot of water and I was frustrated. I started to think about Alcatraz, which was going to be colder water, bigger waves, salt water, and probably more people. What have I gotten myself into? I guess this was prep for that race next year and it was scaring me a little. Three of my other races this year were all time trial starts, so there was never the chaos or waves of this race. We made the final turn and the end looked so far away, yet I kept on going and soon enough, I was running up the ramp and letting the wetsuit peelers take off my wetsuit. Apparently they pulled 100 people out of the water, those who were unable to swim the distance for some reason. That’s a lot of people! In transition, I put on arm warmers, my dry tri top, a vest, full-length gloves & a doo-rag to keep my head warm. As I ran past the bike mount line, I could not get my pedals clipped in, there was too much mud packed into one of my cleats. Earlier someone had suggested putting socks over my shoes just to get out of transition to prevent this from happening, but I didn’t think it was that muddy (forgot to mention it had rained for weeks leading up to this race). I should have listened to them! So after a brief delay to dig out the mud in my cleats, they were clean and I was able to clip on and off I went. I felt comfortably dressed, but the wind was howling. The cross wind was crazy (12-15mph) and I had to hold onto my bike hard in several sections to prevent myself from falling over! The roads didn’t seem as bad as I thought, I was cruising along and felt decent despite the cross winds, though I didn’t realize most of the wind was at my back. I was at 18.8mph average but then hit a wrong button and messed up my Garmin, causing me to totally reset my watch (as I was riding). After about 15-20 miles the hills really started, along with the really bad road conditions. There were sections where you would go down a large hill, only to slow down at the bottom because of large potholes. I wanted to be smart, I wasn’t going to risk getting a flat or crashing in any of those holes (as many cyclists did crash due to the bad road conditions). While the wind was either at our back or crosswind the first 15 miles, it was mostly in our face or a crosswind the remainder of the race. And you were headed back up all those hills you came down at the start, so not only are you dealing with uphills, but also now the wind is in your face. It was pretty brutal. Though I had to reset my watch, the mile markers gave me a good idea of where I was on the course, but my average speed had slowed down considerably. I was getting even more frustrated as my race goal was really getting out of reach. I had biked 3:04 at Chattanooga on a hilly course, so I was hoping for something close to that here…however I hadn’t planned on the wind. And the wind combined with the hills just did me in. About the 40-mile mark, I decided to stop at the water stop & use the bathroom. The thought of peeing while ON my bike was just not appealing, it was too cold to think about it, and I was not on target for my goal time, so I really didn’t care anymore. Another cyclist stopped just seconds before me and ran into the porta-potty so I had to wait, but I really didn’t care. To me my race was “over” so time was no longer important. While waiting, I refilled my water and chatted with a volunteer. I finally started back up, continuing on with the hills and wind. Now the problem with being a strong swimmer and starting early in the morning, is that I don’t have that many people to pass. However, there were about 1500+ triathletes behind me who all seem to be much stronger cyclists and were starting to pass me on the bike. I tried to enjoy the course, but it was hard to look around. The scenery was farms, cows, horses and more farms, yet I spent most of the time staring at the road on the lookout for potholes. The hills & head winds continued, and the miles slowly came. The bike finally ended and I had no idea what my time was since my Garmin was all messed up. But oh well…. I walked my bike into transition, took off all the extra layers I had (though I kept the doo-rag on which was a great head band) and walked out of transition. I didn’t even bother to run through transition as I normally do, although I had no idea what my total time was, I knew I was way off what I wanted. The run was a three-loop course and upon exiting transition, I saw two of my friends there cheering me on. That certainly lifted my spirits, knowing someone was there to support me. In the two weeks leading up to the race, I hadn’t been able to run more than 2 miles. My knee had been hurting and anytime I ran more than one mile, I would get a sharp shooting pain in my knee. I had no idea what I did, I had never had a knee injury before, but I chose to rest it. A few days prior to the race I got a massage by Renee who uses a technique called cupping, and it made a huge difference. My knee felt a lot better yet with it being just a few days before the race, there was no time to test it to see how it was, I was going to have to use the race for that. So as I headed into the 13 mile run, I had NO idea if I was going to be able to run one mile, two miles, 13 or something in between. There was never the question of finishing, even if I had to walk the whole way I knew I’d get to the finish line. Like the bike course, the run was hilly. I reset my watch again so I could at least clock my pace and splits, yet still didn’t know my overall time. There were three big hills (that you repeated three times!!! ), and you could tell by my run splits which ones were the big down hills. Around the 3-mile mark I stopped in the porta-potty just to blow my nose. I had been fighting a cold all week, and it had been dripping so badly and I really needed some tissue. Once again, I didn’t really care about my race anymore, it just didn’t matter. By this time it had warmed up to the low 60s so it was fairly nice to run, it was sunny and there were a ton of fans out there. Every time we looped back to the finish line I saw my friends, plus there were hundreds of people there cheering you on, even if they didn’t know who you were. On the third loop, I began walking up the hills. My legs were not in pain, my knee didn’t hurt and I wasn’t hot, yet I just didn’t want to run anymore. It was strange; I no longer felt the fire within me. I really didn’t care that I was walking. I just didn’t want to run. After the last hill and with the finish line in sight, I picked it up again and ran the last ¾ mile to the finish. The finish line was inside a rodeo arena and as I crossed the finish line, I had tears building up. I was bummed that I didn’t reach my goal, though I also know the weather was tough and it was hard out there. That wind & hills beat me up, it took a lot out of me. Run time: 2:22; Final time 6:40, 16th in my age group. Slowest Half Ironman ever (out of seven that I’ve done). I hung out with my friends that night and had some good Tex Mex, and some local Amy’s ice cream (great post-race splurge!). Later that night many people were posting on the race Facebook group about how hard the race was and how windy it was. Phew I thought, I’m not alone in those thoughts. I spent the next week thinking about this race a lot, wondering all the “what ifs” and then wondering what was next. While I am disappointed in my race results, I have to remember my year: I set out this year to do just ONE 70.3 race. The last Half Ironman I had been training for was in 2006, when I was hit by a motorcycle while cycling & was injured, and it knocked me out of the triathlon world for a couple of years. So when I finally got the health, courage & time to train for a race of that distance again, last winter I signed up for New Orleans 70.3 with my goal of finishing the Half Ironman I wasn’t able to finish 9 years earlier. Then Chattanooga 70.3 was created and announced and with it being so close to home, I signed up for it, thinking it would be a good back up race in case something went wrong in New Orleans. Well nothing went wrong in NOLA, I finished in 6:07 and 9th in my age group (April 2015). Four weeks later, I did Chattanooga in 5:57 and was ecstatic to break 6-hours. A few weeks after that, I was talking with my friend John who told me if I did three Ironman races in a year, I would qualify as in their All World Athlete ranking. Well that sounded cool I thought, why not? 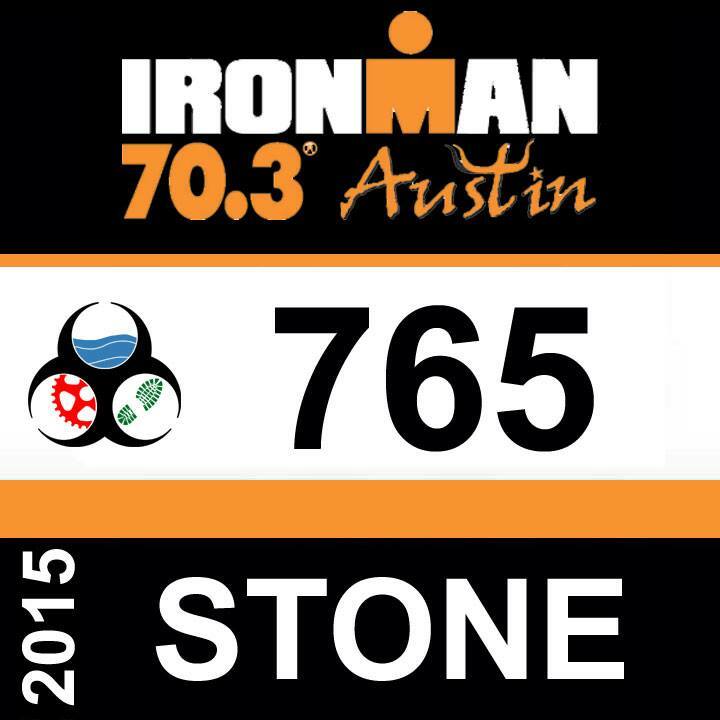 Austin 70.3 had always been a race I wanted to do, it was a good time of year and I figured I had that many more months to build a stronger base and get in better shape. I figured I’d head into the race in great shape and would have a strong race. What I didn’t count on was life getting in the way & other things coming up. I also didn’t count on wind. But I also have to remember I started out this year wanting to do one Half Ironman, and I did three of them. Yikes. So here I am in the midst of trying to recover I am thinking about actually doing another Half Ironman next year. Prior to this Austin race I was saying NO way, I’m done, I can’t do another one, it takes up too much time. And now I’m thinking I need one more, to see if I can do better and go “out” on a better note. Most of the benefit of being an All World Athletes is all the perks you get the following year, so if I don’t do any Ironman races in 2016, then I don’t gain those perks. But does it really matter? Currently I’m ranked 23rd in my age group in the country and 37th in the world. It seems kind of funny, but also kind of cool (see rankings here). So here I am, thinking about 2016, trying to convince myself not to sign up for another Half Ironman. I mean, shouldn’t Alcatraz be enough? What’s in Your Medicine Cabinet? Racing Galore!